Caritas Academy offers an education that begins with the end in mind – the formation of a whole human person, who will mature, flourish, and bear fruit in every area of life; whose path is more than school, college, career – but rather a full and worshipful life that includes work, family, community, church, culture, and service. Below you will the nine principles that make Christian Classical Education unique. Classical education is often characterized as a three-stage process through which students move at appropriate developmental stages. Known collectively as the Trivium, these three stages are grammar, logic, and rhetoric, and are the tools we apply to the discovery of subject matter as well as the subject matter itself. Once students master these tools of learning, reasoning, and communication, they can and will continue to utilize them for a lifetime. These tools are taught throughout every grade at Caritas, but with particular emphasis appropriate to student development. Grammar is emphasized in grades K-6, as the most fundamental building block for effective reading and writing, and includes extensive development of vocabulary and the acquisition of factual information across subject areas Students are presented with original source literature to savor and to memorize, with artistic masterpieces for delight and imitation, and with mathematic and scientific principles that display the wonder of God’s design and beauty. Logic is the primary emphasis in 7th and 8th grades, when students are most eager to debate, to discuss, and to draw connections. Given the tools of effective, respectful construction and deconstruction of arguments, students engage one another, their teachers, and their world with reason and clarity. Well-equipped with the tools of grammar and logic, 9th – 12th grade Rhetoric students are prepared to present their scientific findings, faith convictions, art, creative and expository writing, and research with wisdom and eloquence. The Trivium, in concert with the quadrivium (arithmetic, geometry, music, and astronomy), formed the basis for traditional liberal arts for centuries, and is largely responsible for astonishing flourishing within human experience, particularly within Western civilization. English vocabulary. 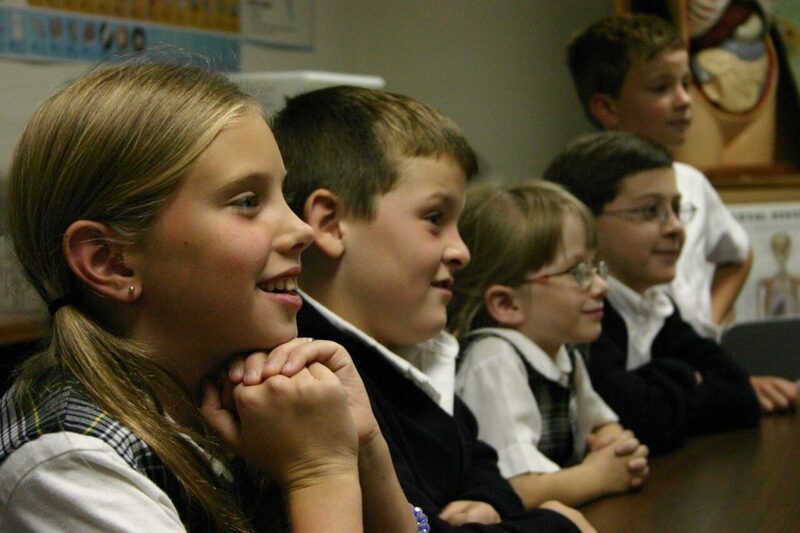 Students are equipped to read the foundational literature of our culture, to correctly decipher unfamiliar scientific, legal, and mathematic terms and to most fully participate in what has been called “The Great Conversation.” At Caritas, students begin their discovery of Latin in 2nd grade. Formal Latin classes continue through 10th grade. Why do certain books endure throughout time and across cultures? What do they have in common and why do they stir rich conversation and provoke reflection among readers of all ages? We believe such books, often considered “the classics,” promote that which most resonates with the mind and soul – the true, good, and beautiful. Created in God’s image (Imago Dei), our minds and souls respond to those human experiences that reveal the sacred and eternal. At Caritas, we believe making space for The Great Conversation – the reading, contemplation, and discussion of the classics – is not a diversion from the task at hand; it is a joy and a core responsibility. Caritas Academy takes seriously her role in loco parentis – that is, assisting parents in the matter of formal education, by their express delegation rather than by right. To that end, we highly value and expect parent participation in the life of our school. We strive for a culture of mutual support, of honoring parents by listening well, welcoming involvement, and together, building a Christ-centered and fruitful community of faith and learning. We also recognize that few in our generation received a classical education, including the staff and faculty of Caritas Academy. While regular training and study are required of our team, parents can struggle to assist children with homework, or to feel fully engaged and confident with the material their students are taught. Part of life in our community is understanding this challenge and meeting it with parent classes and book studies. Many parents find journeying through a Christian classical education with their children to be immensely rewarding – joining in The Great Conversation, unlocking the mysteries of mathematics, deciphering common phrases with new Latin skills, wondering at the interconnectedness of subjects first learned in isolation. We welcome you to join the adventure! mathematic, scientific, social, creative – all informed by experience and culture, and bound by the limitations or expansiveness of language. Awakening students to discover this inter-relatedness is a core principle at Caritas Academy. To this end, students will quickly discern mathematic precision in a beautiful piece of music, geometry peering back at them in art class, Beowulf’s daring literary epic in history, Latin unlocking Biology, and the Creator God undergirding all, “for in Him we live and move and have our being” (Acts 17:28). Caritas Academy is a place of joy and peace; of mental, physical, emotional, and spiritual growth; a place where both the mind and soul are cultivated. On any morning walking through the hallways of a Christian Classical school, you will pass kindergarten classes enjoying their morning devotional, sixth graders comparing the self-sacrifice of our nation’s founding fathers with that of Christ’s, junior high students discussing the implications of humility and service, and a chemistry class pausing to admire the created order. In addition, music and art from hundreds of years of Christian worship are known and celebrated, student assemblies welcome intriguing, culture-making Christ-followers to share their journeys, and our school song, Non Nobis Domine (Psalm 115:1) is sung as a corporate body. More than a Bible class and a chapel service, we desire our students to see Christ preeminent in every area of life, interwoven into every discipline, the first priority in competition, the object of our worship through the arts, worthy of our best efforts and highest devotion. Rather than an education for the elite, the true, beautiful, and good are cultivated in every student, not just for the next test, but for a lifetime, regardless of socio-economic status or ultimate place of employment. At Caritas, we believe our students, who represent a wide spectrum of natural abilities, can and should read from the most noble literature, be familiar with artistic masterpieces, embrace poetry as an enrichment of the human experience, be able to compose and decompose numbers, patterns, and form. In short, we believe that every manifestation of God’s creation and human discovery throughout the ages can be understood and in that understanding, bear fruit. While this approach may be countercultural, it is not new. For hundreds of years, education for every class, for those with a wide range of future prospects, would have included a thorough reading and understanding of original source texts, significant mathematics, familiarity with great works of art and music, and a belief that education was a high privilege, required hard work and was its own reward. extraordinary results. While test results and college admissions are not the end goal, we believe excellent curriculum, presented by nurturing faculty in small classes, in a supportive and joyful setting, creates the environment for every student to flourish. Created in God’s image (Imago Dei), every person has the capacity to “love what is lovely” (Titus 1:8) and to “abhor that which is evil” (Romans 12:9). Sadly, our brokenness distorts our understanding of truth, goodness, and beauty, and in sin we pursue those things that lead away from God and toward personal and community destruction. As a community of faith and learning, Caritas is uniquely positioned to intentionally place before our students the most noble, most just, most beautiful objects of study – holding in high esteem models of excellence throughout history. Year after year, class after class, students will spend the best hours of their day considering, and at times, imitating, masters of the creative arts, writers, scientists, pilgrims, and saints. Engaging not just the intellect, but also the emotion and the imagination in this orientation toward the best and highest is a core responsibility of our faculty and staff. Training the affections to love what is lovely is a corporate and counter-cultural task, and one that must be made in partnership with parents and the wider school community. We are thankful for the role each plays, and gratefully welcome God’s redemptive work among us. The shepherding of young hearts and minds is a high privilege and great responsibility. Building space into each day for teachable moments, even at inopportune times, is a discipline we encourage at Caritas. Addressing student behavior privately, respectfully, and with a true desire to understand the heart issue rather than simply modify behavior, costs time and attention in the short-term. In the long-term, we believe this time is well invested and bears fruit for the individual student and the entire classroom community.